(March 25, 2013) -- Three years since it opened, the nation's first completely bookless library on a college or university campus is thriving. The Applied Engineering and Technology (AET) Library at The University of Texas at San Antonio (UTSA) caters to the research needs of its College of Sciences and College of Engineering and has become an essential resource for its students and faculty. The library has served more than 161,000 students and faculty since it opened its doors as a satellite library in the Applied Engineering and Technology Building on the UTSA Main Campus in March 2010. On average, the library welcomes 1,900 visitors per week when classes are in session. Designed to engage students in an online format, the AET Library features ultra-modern furniture and decor with 10 desktop computers, a printer, a scanner and five large LCD screens. 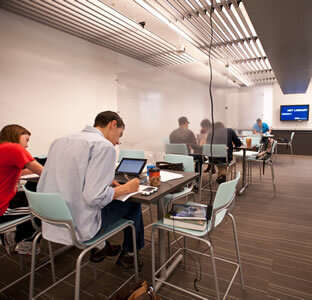 To support student study sessions and collaboration, the library also offers a series of group study niches and three group study rooms outfitted with whiteboards and glass walls on which students can write. The spaces encourage teamwork, communications and problem solving, skills integral to the success of professional engineers and scientists. "This isn't like an ordinary library where you're expected to be quiet and stick to yourself," said David Cruz, a junior mechanical engineering student who also works part-time at the AET Library. "The study areas plus the fact that we can write on the walls and have immediate access to tons of scientific materials make it the perfect place to work on projects and solve problems as a group. This library is always full of people." The AET Library subscribes to approximately 50,000 e-journals and 470 databases providing UTSA students and faculty with full-text access to millions of articles, data sets, videos, conference proceedings and much more. Students can access these materials from any computer, tablet or smartphone with Internet access, whether they are at home, on campus or on-the-go. With more than one million e-books available to UTSA students for checkout, library officials report that e-book circulation was just over 500,000 in 2012. For those who don't have an e-reader of their own, several types of e-readers are available for checkout that are pre-loaded with several popular and research STEM titles. Patrons also can request content to be purchased for the e-readers. "This library has made a tremendous impact on the research and academic success of our science and engineering community and serves as a model for student engagement," said Krisellen Maloney, UTSA dean of libraries. "As UTSA becomes a national research university, we strive to create spaces where students and faculty have access to the academic resources they need in an environment that is designed for collaboration." Librarians with expertise in the fields of engineering and science are on-call for reference and research consultations, strengthening connections with UTSA students and faculty. This includes partnering with faculty to develop assignments that help students learn the critical thinking skills necessary to find and evaluate information in the digital environment. The AET Library has a dedicated staff of science and engineering student library assistants who have been trained to answer reference questions and assist with locating specialized books, articles and reports online. >> See what the AET Library looks like in action in a UTSA YouTube video and Flickr photo gallery. >> Learn more about the AET Library at UTSA. >> Read the original news story about the AET Library.